Iranian news claims the IAF unloaded military equipment at a Saudi base amid reports that United States troops are near Iran’s northern border. The Israeli Air Force recently unloaded military equipment at a Saudi Arabia base, a semi-official Iranian news agency claimed Wednesday, while a large American force has massed in Azerbaijan, which is on the northwest border of Iran. Both reports follow by less than a week the Pentagon’s confirmation that an unusually large American fleet sailed through the Suez Canal Saturday. Several reports stated that an Israeli ship joined the armada. The Pentagon played down the news, saying the American maneuvers were routine. However, a report by Iran on Wednesday that it has enriched dozens of pounds of 17 per cent enriched uranium serves as a reminder that time is running out to stop Iran from being able to produce a nuclear weapon. 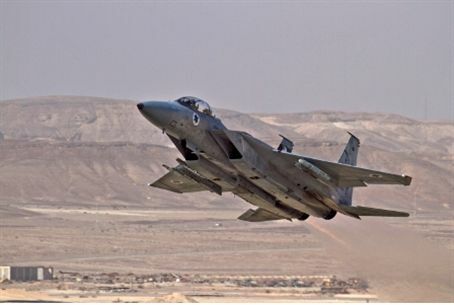 Iran’s Fars News Agency said the Israeli military aircraft landed 10 days ago at the Saudi base near the city of Tabuk, located in northwest Saudi Arabia, one of the closest areas in the oil kingdom to Iran. Fars said that the Tabuk base will be the central station for an Israeli attack on Iran. It quoted an Islamic news site that a commercial airline passenger said the airport in Tabuk was closed to all other traffic during the alleged Israeli landings. The passenger said that "no reasonable explanation” was given for shutting down the airport and those passengers were compensated financially and booked in four-star hotels. Revolutionary Guards Brigadier General Mehdi Moini said Tuesday that his forces are mobilized “due to the presence of American and Israeli forces on the western border.” The Guards reportedly have called in tanks and anti-aircraft units to the area in what amounts to a war alert. As signs point to a higher American-Israeli military profile aimed at Iran, Ali Akbar Salehi, the Islamic Republic’s vice president and director of the nuclear program, announced Wednesday that Iran has produced another 37 pounds of uranium enriched to 20 percent. The production of the uranium defies United Nations demands that Iran stop its unsupervised nuclear development, although the 20 percent level is far below level that is needed to build a nuclear weapon. "Potentially, we can produce 5 kilograms (11 pounds) a month, but we are not in a hurry over this," Salehi told the semiofficial ISNA news agency.